**** 4 stars Visit Scotland. Only a short walk through the terraced garden onto Pitlochry's main street! 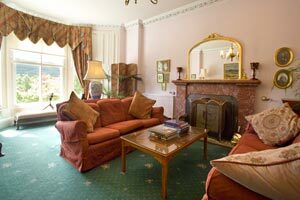 Downstairs lounge: comfortable sofas, a fire in winter, wonderful views and a telescope by the window. 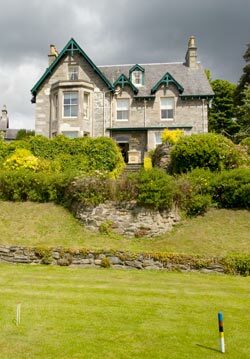 For over 25 years Gretta and Douglas Maxwell have been welcoming guests to stay for bed and breakfast at Craigroyston House their a fine Scottish Victorian villa built in 1863 in a quiet street on the hillside above the main street of Pitlochry. The house has genuinely original decorative features and is decorated in a comfortable traditional style with antiques, paintings and prints. Gretta and Douglas are extremely hospitable and friendly. 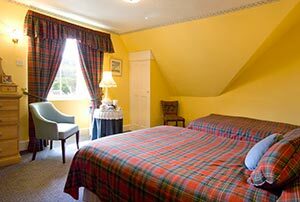 Douglas, whose interests include archaeaology, highland games and history, is a mine of information, and they are both always ready with helpful advice about making the best of your stay in this beautiful part of Scotland. 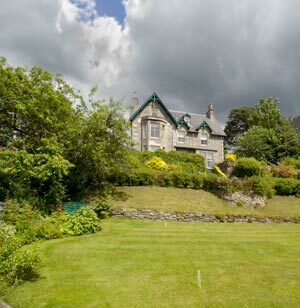 Staying here you drive from Lower Oakfield to park your car in front of the house, but when you want to explore on foot its a short walk through the Maxwell's terraced garden directly onto Pitlochry's main street just where the Tourism Information office is. The Festival Theatre, the famous fish ladder, Edradour Malt Whisky distillery and all the shops, pubs and restaurants are within easy walking distance. 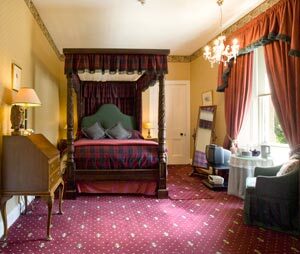 Four poster double bedroom with shower-room en suite. Large family bedroom (twin and single) with a large bay window with great views. 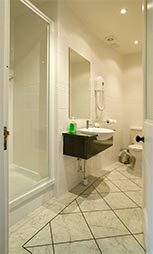 Private shower-room en suite. A "tree-top room" at the top of the house (2nd floor). Great views. Family bedroom (twin and single). 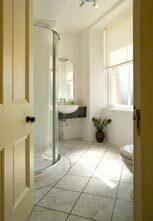 Private shower-room en suite. The dining room. 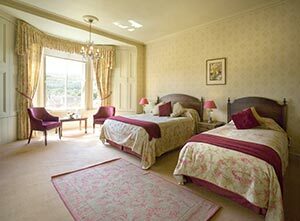 Many of the rooms at Craigroyston House have lovely views across the valley like this. 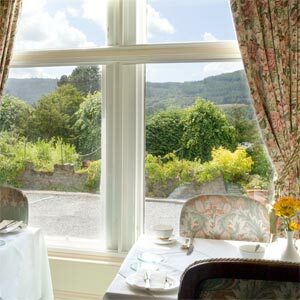 A delicious Scottish breakfast cooked to order, or lighter Continental style breakfast is served in the dining room. Fruit juice, cereals, yoghurts croissants, free-range eggs and organic ingredients used when possible. There are good places to eat out in Pitlochry and Douglas and Gretta can advise. Prices per person per night based on two people sharing a room. The price range depends on the season. No pets in the house please, and no smoking. WiFi access available for guests. You are welcome to play! Please tell Gretta and Dougie you found Craigroyston House through About Scotland!